The hairs on the back of my neck stand up every time I look at her. I love horror movies. I have since my dad let me watch George Romero’s 1968 Night of the Living Dead when I was about five or six; I woke up at 10 or 11 at night on a Friday and Dad was watching it. He let me cuddle up with him and I think I saw basically the entire movie. I was terrified of walking around the house without all of the lights blazing for months afterwards. My mom was pissed. So when JDevL linked me to KillScreenDaily’s coverage of Night Terrors, it was clickbait. Look, you know your smartphone has all kinds of measurement devices in it with varying levels of utility, right? Well, the guys behind the Indiegogo campaign for Night Terrors decided to take advantage of the fact that you’re carrying around a modern-day Tricorder to scare the crap out of you. Plug in your headphones, turn off the lights in your house, and use your smartphone to “save the girl and stay alive.” That’s it. Using your GPS and accelerometers and who knows what else, Night Terrors builds an augmented reality in your own house. Your flash is your flashlight, you detect god-knows-what Eldritch horrors using your camera, and your speakerphone blends ambient noises to make them extra creepy. Adding Vincent Price automatically makes any movie 1,000% scarier. Ever since my personal Night of the Living Dead, I’ve had a thing for horror movies. Good ones and bad ones (if you’re a horror movie fan, you know that especially in the horror genre, bad can actually be better than good, and not in the King of Pop kind of way). 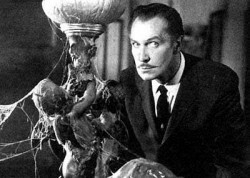 One of the best I’ve seen remains the 1958 film House on Haunted Hill because, despite some pretty lame practical effects, it relied on suspense and things not seen out of the corner of your eye. 2001’s The Others is a good modern example. I’m not a fan of ‘realistic’ horror movies like Last House on the Left or Vacancy ,and Eli Roth and the Saw films (after the first one) can go snuff themselves. I love horror movies with monsters and ghosts, not some flick glorifying in what horrifying things mankind can do to one another. The Thing (the original or the 1982 John Carpenter/Stan Winston freaking masterpiece) is always going to trump tortureporn. Look, we’re not shills for anyone here at Horrible Night, but even if you don’t want to play Night Terrors, you definitely want to see what happens when I play Night Terrors and we get it on camera, so you should go over to their fundraising page and support it. Thankfully, we have an abundance of baby wipes for when I poop myself playing this. GiffTor - Dog lover. Fake angry letter writer. Imperative sentence user. Retro reviewer, completionist and knows what Archon is. Environmental Lawyer by day.